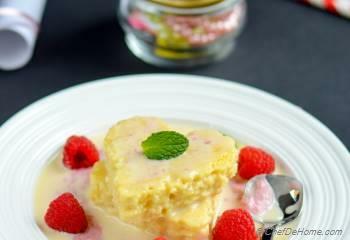 Tres Leches - sponge cake soaked in sweet milk sauce made with three kind of milks. 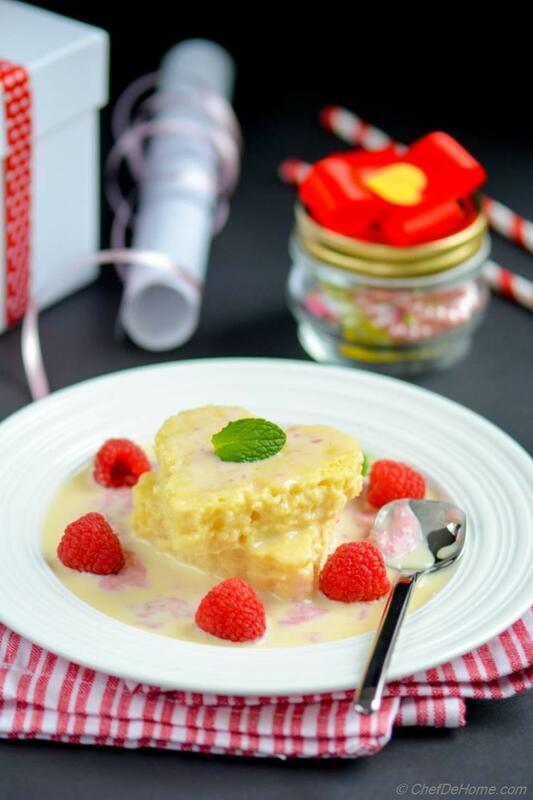 Soft sponge cake absorb all the milk and it's sweetness making rich and decadent dessert without much effort. Perfect to impress your valentine this Valentine's day! Without doubt, Tres Leches is a delicious dessert. But I also love it because how easy it is to prepare. No fancy icing or extra hours in kitchen. 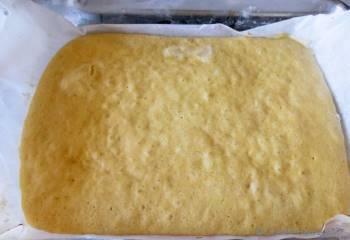 Only make a sheet sponge cake which bakes much faster, mix three milk sauce. Add raspberries for color. Serve a cake just like Mexican restaurants made at home! 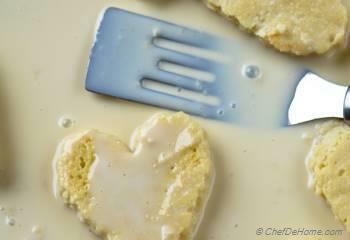 Today, I made a sheet sponge cake and cut-out hearts to drench each piece in milks fully... making every piece to-die for! A little raspberry sauce to contrast the sweetness of cake and fresh raspberries for some element of freshness. Often, this cake is sold with a big pile of whipped sweet cream. I don't think that Tres Leches slice needs that. But if you trying it first time, I do recommend adding a flower of fresh whipped sweet cream. 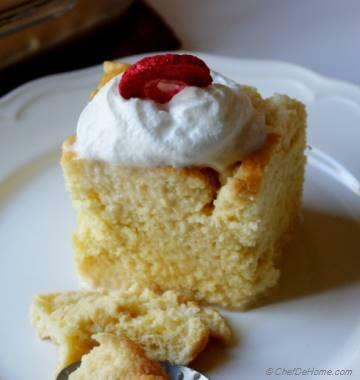 Until the day this blog exists, I don't know how many more variations of Tres Leches I will share with you.... but I remember.... describing it in one of my old Tres Leches recipe.... quoting the same here.. I think pictures say it all! I hope you will enjoy it as much as we do. 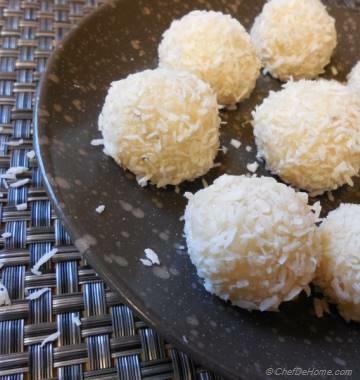 Few more Valentine's Day treats from my recipe repertoire! 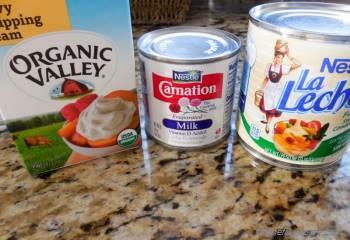 Smart Swap You can use strawberries or even chocolate for cream sauce! 1. Pre-heat oven to 350 degrees Fahrenheit. Line a rectangle sheet pan with parchment paper hanging on two opposite sides and set aside. Thickness of cake will depend on size of sheet tray. 2. 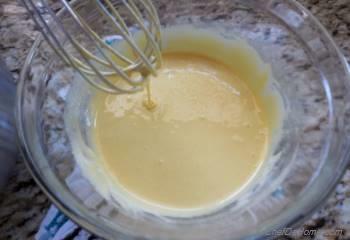 Beat egg yolks (egg yellows) with 1/3 cup sugar until pale yellow in color. (about 5-6 minutes) Add in vanilla. Beat for 1 more minutes. 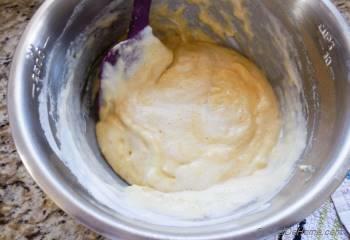 Egg mixture will leave a trailing ribbon when lifted with whisk. 4. Mix flour with baking powder and salt. Sift 1/4 of flour in the egg yellows mixture. Gently combine the flour in egg yellow in 3 batches. Do not over-mix. 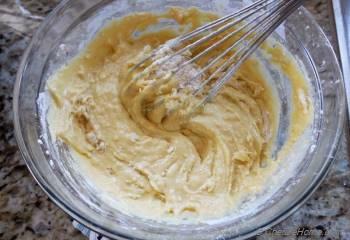 I usually use a hand whisk to combine flour in egg yellows. 5. 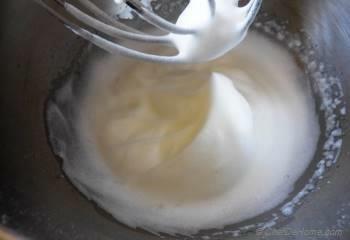 Add 1/4 of egg whites to yellows and fold in to lighten the batter. Then, add remaining half of the egg whites and gently fold in with lift and fold gentle strokes without deflating the airy whites. Add the remaining egg whites and fold in following the same cut and fold action. 6. Pour prepared batter into baking pan and level very gently with an offset spatula or a butter knife. 7. 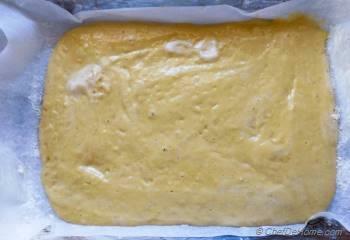 Bake for 18-22 minutes until tooth pick inserted into the center of cake comes out clean and cake is springy to touch. Run knife on the sides of pan to loosen cake. Lift cake with hanging parchment paper and, invert the cake to cooling rack and peel off the parchment. 8. In a small jar, combine all three kinds of milks and whisk to mix condensed milk with evaporated and heavy cream. 9. Transfer the cool cake to a rimmed pan and pierce the top of cake with fork or tooth pick stick all over to make tiny small holes. 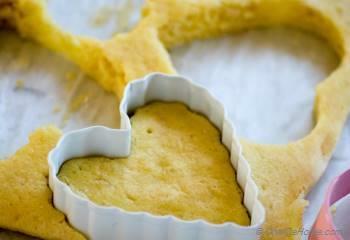 Cut the hearts using heart shape cookie cutter. Try to cut close so as to yield about 12 hearts. 10. Now pour all the three milk mixture (tres leche) over the cake, distributing it evenly, leaving behind 1/4 of a cup for raspberry sauce. Stop in-between if milk appears to be standing on the top. Give cake sometime to absorb the milks. 11. Transfer the cake to refrigerator for about 30 minutes. this gives cake time to absorb all milk setting at the bottom. 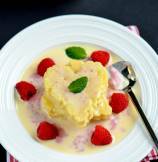 In meantime, mix 1/4 cup of milk mixture with raspberries in a food processor to make a fine puree. 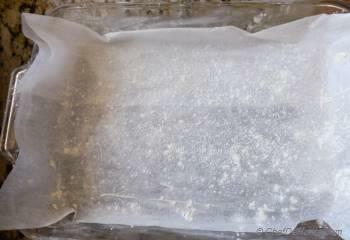 Transfer to a bowl and refrigerate as well. 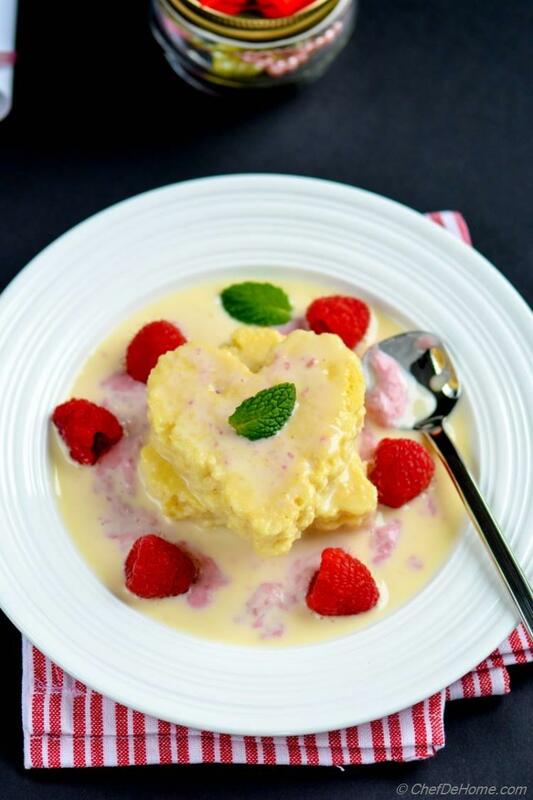 When ready to serve, layer two hearts per serving with drizzle of raspberry cream sauce. Garnish with some fresh raspberries and mint. Serve and enjoy! *Separate eggs (whites and yolk) when still cold then let come to room temperature before using. Danni, thanks! I'm sure, in Mexico, they will have most-authentic tres leches!! Please do try recipe and let me know! I had the most amazing tres leche cask when I was in Mexico and I keep meaning to make it, so I am going to try your recipe! Jess, thank you so much! Anu, thanks! 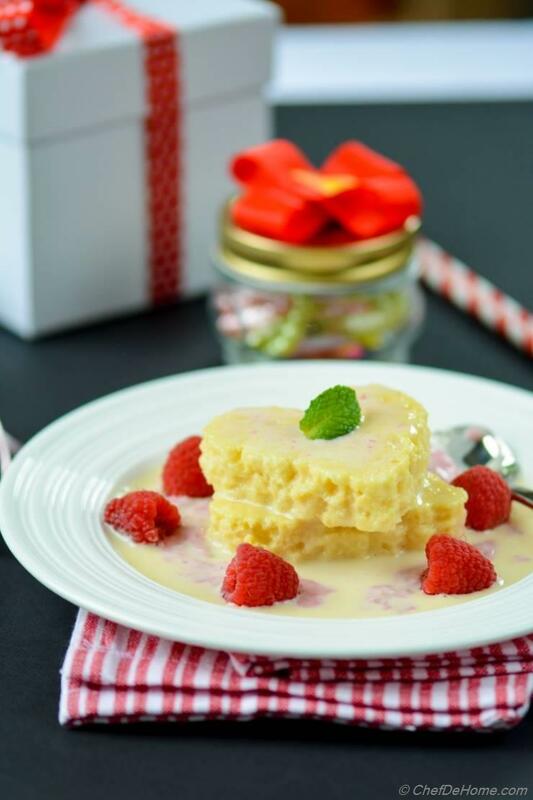 tres leches with raspberries is really delicious! Ritu, it sure it! I'm glad you gonna try it! :) thank you so much! Jeena, thank you so much dear! Manali, thanks! you know, the combination of three milks is to die-for! totally addictive! Absolutely yummy cake Savita! I have never made tres leche but it's on my baking bucket list...the combinations of 3 milks sounds awesome..this is perfect for Valentines! thank you so much, Andrea! Sure, please do check and let me know how you like it! Gingi, thank you so much! indeed! this will be perfect for Valentine's day! absolutely to die for ! 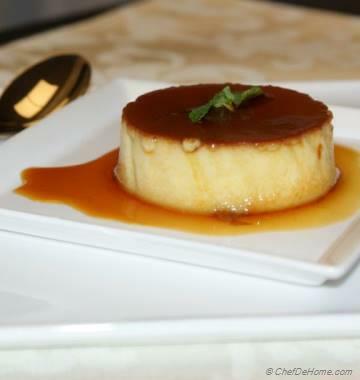 I agree Savita, indulgence once in a way that too with Tres leches is WELCOME :)) superb slicks and wonderful recipe!